If any of you have found yourself in a slump or need a kick in the pants to try something new, try taking a challenge. You can find them on most online forums, in books and magazines, scrapbooking websites, or make your own! 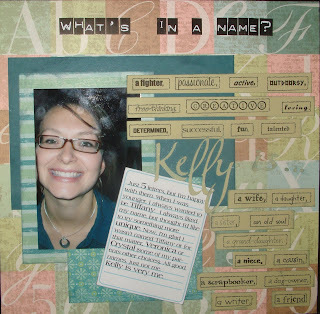 I recently took a scrapbooking challenge from the Concealed Beauty Forum (a great new scrapbooking website) that encouraged participants to scrapbook their name. It was fun and it made me put aside the other photos I'd been working on and change my perspective. Check out Concealed Beauty to try the same challenge. Hey girl!! OK I found your blog :D Great layout here! Ill be peeking in often now lol!